Viewing at the telescopes from 6.30pm -7.30pm, Bookings required – Book here on Trybooking. A FIELD GUIDE TO THE STARS – Free – Charge for viewing as below. Photography and astronomy have an intrinsic relationship, reflected in technical advances and the collective imagination of space. A Field Guide to the Stars is a group exhibition that explores how space might be understood through photomedia. Through a constellation of photographic and moving image projects, celestial observatory spaces are conceptually linked with contemporary and historical artworks. 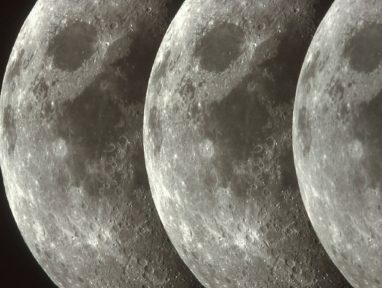 Featuring seven Victorian and international photographers, the exhibition comprises Australian astronomical photography, artistic inquiries related to the cosmos, a site-specific camera obscura, vintage photographic plates from the Australian Astronomical Observatory, photographs from the Lunar Orbiter V (1967) and outdoor video projection events. Central to A Field Guide to the Stars is the role of astronomical observatories and archives, as well as an exploration of human perception of scale, distance and time. The exhibition, curated by Rebecca Najdowski, obscures the boundaries between art, science, technology and archival material, and brings together unique and varied photoartistic practices with historical, scientific astronomical photography and ephemera to explore the human position within an ever-expanding universe. With its 130-year history, Ballarat Observatory is the perfect location to experience this special exhibition under the stars. The exhibition features the work of Clare Benson, Alex Cherney, Kate Golding, Kate Robertson, Hillary Wiedemann, Rebecca Najdowski and Eric William Carroll. Rebecca Najdowski is a visual artist, writer and academic. Her practice includes camera-less analogue photograms, video, sculptural light installations and augmented reality (AR) interventions. These works have been exhibited and screened internationally in the UK, Greece and beyond. Najdowski received her MFA from California College of the Arts and was awarded a Fulbright Fellowship to Brazil. She currently lives in Melbourne, where she lectures photography at RMIT and is undertaking her PhD in visual arts. Clare Benson is an American photographer and interdisciplinary artist, whose work explores themes of family history, tradition, science, and mythology. In 2014/15 she received a Fulbright Fellowship to Sweden, and has also received a grant from the American-Scandinavian Foundation and the Photolucida Critical Mass Book Award. Benson’s work has been exhibited, screened, and featured in publications across the US and internationally. Alex Cherney is a keen astronomer and photographer who travels throughout Australia to photograph the most beautiful landscapes under the stars. His images and videos have been published in well-known astronomy magazines and books, and won prestigious awards both in Australia and internationally. Alex ‘s work involves time-lapse imaging of night sky which shows the motion of celestial bodies in relation to the landscape and helps connect viewers with the night sky. Alex will run a workshop on Sunday 10th September, Bookings Essential. Kate Golding is an award-winning artist based in Melbourne who utilises photographic processes to examine colonisation while reflecting critically on her own settler heritage. Currently undertaking a Master of Fine Arts by Research degree at the Victorian College of the Arts, her research project focuses on First Nation sovereignty, the memorialisation of Captain Cook and the creation of counter-monuments. Golding has exhibited both nationally and internationally. Hillary Wiedemann is a Chicago based multi-media artist. She received an MFA in sculpture from California College of the Arts, and a BFA in glass from Rhode Island School of Design. Using glass, light, reflective/refractive materials, photography, video, and audio, her work explores the subtle differences between passive and active states of perception, and the translation of light into object and experience. She has exhibited her work in the US, Belgium and Iceland, and is a current resident at Hatch Projects at the Chicago Artists Coalition. Eric William Carroll’s work on photography, science and nature explores the differences in how we experience, represent, and organise the world. Through his photographs, installations and performances, Carroll creates visual and emotional connections that span enormous distances in space and time. Carroll’s work on photography, science, and nature has been exhibited widely, including the New Orleans Museum of Art, Aperture Foundation, the Museum of Contemporary Photography and Pier 24 Photography. Carroll was the winner of the 2012 Baum Award for Emerging Photographers. Sun 12pm–5pm Generally no viewing at telescopes in the evening, except on Sunday 10th September for the participants in Workshop if it is clear. Cost for viewing at telescopes $22 Adult, $17 Concession, $12 Students under 18 yrs, $52 Family of 2A 2S, $57 Family 2A 3S. 3rd Rock Café open 10.30am to closing of BIFB as above.